The recreational use of the plant Cannabis sativa and the attempt to exploit their potential therapeutic use have been described over the centuries. The popularity of marijuana, one of the most common forms of consumption as a recreational substance and as a drug, reflects its ability to later sensory perceptions and to reduce anxiety. Other non-psychoactive actions of marijuana, like pain relief, were also described in ancient texts. However, the biochemical and pharmacological study of this substance has a fairly recent start. The first attempts to isolate the cannabinoids (phytocannabinoids) of Cannabis sativa, conducted in mid-twentieth century, led to very rudimentary pharmacological investigations. In the sixties, the chemical structures of Δ-9-tetrahydrocannabinol (Δ 9-THC) and cannabidiol were described, their procedures for synthesis were found and THC was identified as the major phytocannabinoid among the 60 existing phytocannabinoids in Cannabis sativa. Endocannabinoids (EC) are involved in several physiological functions, among which, special attention has been given to the regulation of appetite by central mechanisms and its influence on obesity. , Considering these innovative findings, the research for new pharmacological agents has drastically increased and the discovery of rimonabant, a synthetic antagonist of CB1 receptors, has confirmed the important role of endocannabinoid system on the modulation of food ingestion and energetic balance. These facts led to the first clinical studies using rimonabant as a new tool against obesity and its associated metabolic disorders. However, psychiatricside-effects, namely central, which include increased risk of depression and even suicide, US Food and Drug Administration declined permission for rimonabant, and in October 2008, rimonabant was also suspended across the EU. After rimonabant withdrawal, other CB1 antagonist drugs have also tested, including the taranabant, which was associated with weight loss in rats and in humans. , However, due also to central side effects, including anxiety and depression, the clinical trials were stopped in October 2008 (EMEA. The European Medicines Agency recommends suspension of the marketing authorisation of Acomplia: http://www.emea.europa.eu 2008 ). Although several other different influences of endocannabinoids have been discussed during the last years, including in inflammation, diabetes, cancer, affective and neurodegenerative diseases, and epilepsy. the most recent findings are related to their cardiovascular actions,  which seem to be very ample bust also complex. The endocannabinoid system (ECS), which includes the endocannabinoids and its receptors, have been implicated in hypotensive stages associated with hemorrhagic chock, both endotoxic and cardiogenic, and even to advanced liver cirrhosis; on the other hand, recent evidence suggests that ECS plays an important role in cardiovascular regulation associated with hypertension, as well as a protective role in ischemia grafting. The development of atherosclerotic plaque and the metabolic stages associated to obesity are also matter of study of possible ECS pharmacomodulation. This article reviews the effects of endocannabinoids on the cardiovascular system, focusing on their role on cardiovascular pathophysiology and on new therapeutic opportunities in this field. The endocannabinoid signaling system is composed by the endocannabinoids and their cellular receptors, together with the messengers and carriers that support the traffic of these hydrophobic mediators between cells and enzymes directly responsible for the biosynthesis and metabolism of endocannabinoids constitute. In line with the hydrophobic nature of the endocannabinoids and the selective provision of receptors in tissues, the metabolism and distribution of endocannabinoid metabolizing enzymes helps to define the broad influence that these lipid mediators can exert on mammals physiology. The balanced action of these enzymes of endocannabinoid biosynthesis and metabolism are essential for strict homeostatic regulation of endocannabinoid signaling. Contrary to many neurotransmitters that are stored in intracellular vesicles, awaiting their mobilization in the bioactive form, endocannabinoids are synthesized "on demand" in response to increased intracellular calcium induced by stimuli. In humans, the acute effect of smoking Cannabis usually manifests by an increase in heart rate, without significant changes in blood pressure. However, the chronic use of Cannabis in man, in addiction with acute and prolonged administration of THC to animals, causes a decrease in long-term blood pressure and heart rate. Given the well known effects of cannabinoids in the CNS, the first studies focused on the ability of these substances to inhibit the sympathetic tone as the underlying mechanism. Indeed, experiments in dogs showed some evidence for a THC centrally mediated sympathetic inhibitory effect, although some peripheral sites of action could not be excluded. In this way, in an early stage, the potential use of cannabinoids as anti-hypertensive drugs was considered,  hoping that the cardiovascular and the psychoactive effects could be separated. This hypothesis was first suggested in 1977, with the publication of the biological effects of "abnormal cannabidiol", a synthetic analogue of cannabidiol, the non-psychoactive cannabinoid present in Cannabis sativa. However, more than two decades passed before the development of this promising observation. The acute effects of drug on blood pressure result from changes in peripheral vascular resistance, cardiac output, or both. Although the exclusive role of CB1 receptors in the hypotensive effect of cannabinoids is strongly suggested, there is a growing evidence that vasodilatation induced by anandamide in the mesenteric vascular flow, and possibly elsewhere, is dependent of CB1 and CB2 receptors. It was soon demonstrated that the vasodilator response caused by anandamide in blood flow could be inhibited by indomethacin  and, thus, it was surmised that anandamide induces vasodilatation indirectly by producing arachindonic acid and its subsequent metabolism by cyclooxygenase. Although THC also produces a sensitive response to indomethacin, subsequent studies have not documented an effect of cyclooxygenase inhibition in vasodilatation induced by anandamide in other blood vessels, including mesenteric and coronary vasculature,  excluding the production of prostanoids as a major mechanism for the vasodilator effect. The existence of non-CB1 and non-CB2 receptors have been hypothesized repeatedly during the last years. One of the most studied possibilities is the transient receptor potential vanillinoid (TRPV) receptors, in particular, but not only, the TRPV1, including on the vasculature. Unlike the vascular effects of cannabinoids, whose knowledge is increasing, not much is known about their direct cardiac effects. Anandamide, anandamide amidohidrolase and the signs of message to CB1 receptor , were detected in the human heart. In a more recent study, the existence of CB1 receptors was confirmed in human auricular myocytes by immunoblotting and immunohistochemistry. In the same study, it was shown that anandamide, R-methanandamide and HU-210 all decreased, in a dose-dependent way, the contractility of isolated and electrically stimulated human atrial muscle. AM51 is a potent and selective CB1 receptor antagonist  which has blocked the negative ionotropic effect of three drugs, excluding the involvement of CB2 receptors activation, NO and prostanoids release. Consistent with these in vitro results, it was shown that HU-210 decreases the cardiac output depending on CB1 receptors activity. Previous studies had shown that anandamide induces coronary vasodilatation sensitive to rimonabant in isolated perfused rat hearts,  which meant cannabinoid receptors. These results were mimicked by arachidonic acid, indicating a vasodilator effect, not mediated by metabolites of arachidonic acid. According to what is observed in isolated cardiac preparations, the use of Millar system of pressure-volume conductance to measure cardiac performance in vivo has strongly supported the idea of a crucial component in the cardiac hemodynamic effects of cannabinoids. Taken together, those studies suggest that CB1 receptors are present in cardiomyocytes and that they can induce a decrease of cardiac contractility trough mechanisms that can be dependent or independent from the CB1 receptors. Overall, despite the role of CB1 receptors and of endocannabinoids in the protection given by the preconditioning against myocardic I/R, the issue remains controversial, recommending further investigation namely using mice with deletion of genes and more selective agonists of CB2 receptors. However, the findings that imply CB2 receptors' importance, presumably in both endothelial and inflammatory cells and perhaps in cardiomyocytes, are quite encouraging. The endocannabinoid system may constitute an essential mechanism of neuroprotection, in both acute forms of neuronal injury, such as stroke or brain trauma, and in several chronic neurodegenative disorders, including multiple sclerosis, Parkinson's disease, Hungtington's disease, Alzheimer's disease and amyotrophic lateral sclerosis. Although the exact mechanisms of this neuroprotection are not yet completely understood, several processes dependent and independent of CB receptors seem to be involved: 1) modulation of the immune responses and release of inflammatory mediators by CB1, CB2 and not CB1/not CB receptors in neurons, astrocytes, microglia, macrophages, neutrophils and lymphocytes;  2) modulation of synaptic plasticity and excitatory glutamatergic transmissions via presynaptic CB1 receptors;  3) activation of cytoprotective signaling pathways;  4) modulation of calcium homeostasis and excitability trough interactions with calcium channels, potassium and sodium, gap junctions and intracellular calcium reserves, and with NMDA receptors;  5) central hypothermia mediated by CB1 receptors, presumably by the reduction of the metabolic rate of needed oxygen; 6) antioxidant properties of cannabinoids;  7) modulation of endothelial activity and inflammatory response, leucocytes mobilization, adhesions to the endothelium, transmigration and activation presumably through CB2 receptors. In general, it seems clear that both agonists and antagonists of CB1 receptors may play a neuroprotective effect on cerebral I/R injury. The reason for the contradictory effects of the pharmacological blockade versus genetic "knockout" of CB1 receptors is still unclear, but could be related with effects that are independent from CB1 antagonists, and that's the reason why this subject requires further clarification. In the case of CB2 agonists, the most likely protection mechanism is the reduction of increased leukocyte infiltration, mobilization and adhesion to vascular endothelial cells and consequent activation, in a process induced by I/R transient injury. In global terms, it seems clear that both cannabinoids and antagonists of CB receptors may exert several beneficial effects in shock models in rats; however, the specificity of these effects and their importance for the circulatory shock in humans requires further investigation. In addition to the studies in animal models that were already mentioned, it was found that inhalation of THC causes a greater and more lasting fall in blood pressure in hypotensive subjects when compared with normotensive subjects. Although the mechanism underlying this increased sensitivity is not cleared yet, it suggests a role of endocannabinoid system in the regulation of cardiovascular functions in hypertension. In a recent study, using three different experimental models of hypertension to explore this possibility, the authors found a significant endocannabinergic tone in hypertension that limits the blood pressure rise and cardiac contractility through the activation of cardiac and vascular CB1 receptors. It was also found, that over-regulation of these same receptors contributes to potentiate of this tone, maybe trough the inhibition of the activation of endogenous anandamide, stabilizing blood pressure and the contractility of the heart in hypertension. These findings contribute to the interesting possibility of using inhibitors of fatty acid amide hydrolase in the treatment of hypertension. More clinical studies will be needed to clarify this interesting possibility in a near future. Contrary to the potential beneficial effect in cardiovascular disease, the endocannabinoids may exhibit some prothrombotic effects. In fact, both anandamide and 2-AG were described as activators of human and rodent platelets. The platelets are cellular anucleated fragments that circulate on blood stream. Besides their recognized role in homeostasis and in thrombus formation, platelets may also have proinflammatory properties and be growth regulators, contributing to the progression of atherosclerosis. Endothelial cells, macrophages and platelets may, by itself, increase their synthesis of endocannabinoids during the formation of atherosclerotic plaque, leading to the activation of platelets. Alternatively, these cells are able to metabolize 2-AG and anandamide, which can offset the increased levels of cannabinoids. In overall, despite some interesting findings, a specific role of endocannabinoid signaling during atherosclerosis remains to be better elucidated. Obesity remains a continuous healthy problem and research issue, which is explained by the serious consequences associated with it, as well as by the increasing incidence of type 2 diabetes and associated obesity, including in younger individuals. In this way, the EC, due to its well known properties of weight control and energy balance, appeared as a promising target for the treatment of obesity, namely by blocking its receptors. The blockade of these receptors was effectively done by rimonabant, which was viewed as a promising drug for the treatment of obesity. Besides its action on obesity, rimonabant has also proved to be efficient in controlling vascular diseases in several clinical trials and, therefore, this drug was presented as an effective therapeutic approach for treating obesity and cardiovascular disease. However, despite the proven effectiveness in weight loss, rimonabant clinical use was associated with several side effects, which mainly includes the following three groups: the first one includes psychiatric disorders such as depression and anxiety; the second one is associated with gastrointestinal disturbances such as nausea; and finally the third group with regard to neurological changes that are reflected in headaches and vertigo. Despite these adverse effects, which originated its removal from the marker, since the blockade of CB1 receptors continues to prove an asset in the management of obesity and its associated risks (such as reduction of lipogenesis, decreased waist circumference, insulin resistance and dyslipidemia), research in the modulation of the ECS has continued. Although CB1 receptors seem to be the main target for new therapeutic interventions, CB2 receptors are also involved in several mechanisms and, since they are present in immune cells and are, apparently, involved in modulating immune responses, they are extremely important and may be seen as a therapeutic target as well. Several line of evidences have been clearly suggesting that cannabinoids and their endogenous and synthetic analogs can promote important cardiac effects, which includes hypotension and cardiodepression. The actions seem to be mediated by complex mechanisms, including both direct and indirect effects both on the vasculature and on the myocardium. Furthermore, the ECS, including endocannabinoids and cannabinoid receptors, have been implicated in the myocardial and cerebral ischemia/reperfusion, in hypotensive state associated with hemorrhagic, endotoxic and cardiogenic shock, and in advanced liver cirrhosis. There is also promising evidences hypothesizing a key role for the endocannabinergic system in the cardiovascular regulation in hypertension, as well as a beneficial action on atherosclerotic plaque. Resuming, cannabinoids are able to modulate a countless number of physiologic functions, demonstration a pleiotropic protective action on the cardiovascular physiology [Figure 1] and therefore, endocannabinoid system is a potential target for the treatment of several diseases and the research about this subject still have a long way to go. The continued approach of biophysics and molecular characterization of ligands for the cannabinoid receptor will contribute decisively to the success of cross-level research of ECS. Those advances will be pivotal for the development and definition of the profile of new chemical entities as therapeutic endocannabinoid modulators. They may also facilitate the identification of new dynamics of the ECS to be used as predictive and/or diagnostic orientation biomarkers for the patients, as well as therapeutic based on ECS pharmacomodulation. The therapeutic approach of cardiovascular system starting from the modulation of ECS appears to be a promising and multidisciplinary issue of study that is still in its early stages but that could be a field for better therapeutic intervention in several disorders, including of cardiovascular and cardiometabolic nature. PC, AMR, FMM, HT and FR drafted the manuscript. HT and FR critically reviewed the manuscript. All authors read and approved the final manuscript. 1. Irving AJ, Rae MG, Coutts AA. Cannabinoids on the brain. ScientificWorldJournal 2002;2:632-48. 2. Ameri A. The effects of cannabinoids on the brain. Prog Neurobiol 1999;58:315-48. 3. Biegon A. Cannabinoids as neuroprotective agents in traumatic brain injury. Curr Pharm Des 2004;10:2177-83. 4. Hanus LO. Pharmacological and therapeutic secrets of plant and brain (endo)cannabinoids. Med Res Rev 2009;29:213-71. 5. Howlett AC, Barth F, Bonner TI, Cabral G, Casellas P, Devane WA, et al. International union of pharmacology. XXVII. Classification of cannabinoid receptors. Pharmacol Rev 2002;54:161-202. 6. Patel KD, Davison JS, Pittman QJ, Sharkey KA. Cannabinoid CB(2) receptors in health and disease. Curr Med Chem 2010;17:1393-410. 7. van Thuijl H, Kola B, Korbonits M. Appetite and metabolic effects of ghrelin and cannabinoids: involvement of AMP-activated protein kinase. Vitam Horm 2008;77:121-48. 8. Kirkham TC. Cannabinoids and appetite: food craving and food pleasure. Int Rev Psychiatry 2009;21:163-71. 9. Butler H, Korbonits M. Cannabinoids for clinicians: the rise and fall of the cannabinoid antagonists. Eur J Endocrinol 2009;161:655-62. 10. Fong TM, Guan XM, Marsh DJ, Shen CP, Stribling DS, Rosko KM, et al. Antiobesity efficacy of a novel cannabinoid-1 receptor inverse agonist, N-[(1S,2S)-3-(4-chlorophenyl)-2-(3-cyanophenyl)- 1-methylpropyl]-2-methyl-2-[[5-(trifluoromethyl)pyridin-2- yl]oxy]propanamide (MK-0364), in rodents. J Pharmacol Exp Ther 2007;321:1013-22. 11. Addy C, Wright H, Van Laere K, Gantz I, Erondu N, Musser BJ, et al. The acyclic CB1R inverse agonist taranabant mediates weight loss by increasing energy expenditure and decreasing caloric intake. Cell Metab 2008;7:68-78. 12. Izzo AA, Borrelli F, Capasso R, Di Marzo V, Mechoulam R. Non-psychotropic plant cannabinoids: new therapeutic opportunities from an ancient herb. Trends Pharmacol Sci 2009;30:515-27. 13. Durst R, Lotan C. The potential for clinical use of cannabinoids in treatment of cardiovascular diseases. Cardiovasc Ther 2011;29:17-22. 14. Di Marzo V, Petrosino S. Endocannabinoids and the regulation of their levels in health and disease. Curr Opin Lipidol 2007;18:129-40. 15. Pertwee RG. The pharmacology of cannabinoid receptors and their ligands: an overview. Int J Obes (Lond) 2006;30 Suppl 1:S13-8. 16. Demuth DG, Molleman A. Cannabinoid signaling. Life Sci 2006;78:549-63. 17. Oz M. Receptor-independent actions of cannabinoids on cell membranes: focus on endocannabinoids. Pharmacol Ther 2006;111:114-44. 18. Liu J, Wang L, Harvey-White J, Huang BX, Kim HY, Luquet S, et al. Multiple pathways involved in the biosynthesis of anandamide. Neuropharmacology 2008;54:1-7. 19. Sugiura T, Kishimoto S, Oka S, Gokoh M. Biochemistry, pharmacology and physiology of 2-arachidonoylglycerol, an endogenous cannabinoid receptor ligand. Prog Lipid Res 2006;45:405-46. 20. Matias I, Di Marzo V. Endocannabinoid synthesis and degradation, and their regulation in the framework of energy balance. J Endocrinol Invest 2006;29(3 Suppl):15-26. 21. Ho WS, Randall MD. Endothelium-dependent metabolism by endocannabinoid hydrolases and cyclooxygenases limits vasorelaxation to anandamide and 2-arachidonoylglycerol. Br J Pharmacol 2007;150:641-51. 22. Bisogno T. Endogenous cannabinoids: structure and metabolism. J Neuroendocrinol 2008;20 Suppl 1:1-9. 23. Mechoulam R, Fride E, Ben-Shabat S, Meiri U, Horowitz M. Carbachol, an acetylcholine receptor agonist, enhances production in rat aorta of 2-arachidonoyl glycerol, a hypotensive endocannabinoid. Eur J Pharmacol 1998;362:R1-3. 24. Kanakis C, Pouget JM, Rosen KM. The effects of 9-THC (cannabis) on cardiac performance with or without beta blockade. Circulation 1976;53:703-9. 25. Rosenkrantz H, Braude M. Acute, Subacute and 23-day chronic marihuana inhalation toxicities in the rat. Toxicol Appl Pharmacol 1974;28:428-41. 26. Vollmer RR, Cavero I, Ertel RJ, Solomon TA, Buckley JP. Role of the central autonomic nervous system in the hypotension and bradycardia induced by (-)-delta 9-trans-tetra-hydrocannabinol. J Pharmacol 1974;26:186-92. 27. Archer RA. The cannabinoids: therapeutic potentials. Annu Rep Med Chem 1974;9:253-9. 28. Adams MD, Earnhardt JT, Martin BR, Harris LS, Dewey WL, Razdan RK. A cannabinoid with cardiovascular activity but no overt behavioral effects. Experientia 1977;33:1204-5. 29. Varga K, Lake K, Martin BR, Kunos, G. Novel antagonist implicates the CB1 cannabinoid receptor in the hypotensive action of anandamide. Eur J Pharmacol 1995;278:279-83. 30. Járai Z, Wagner JA, Varga K, Lake KD, Compton DR, Martin BR, et al. Cannabinoid-induced mesenteric vasodilation through an endothelial site distinct from CB1 or CB2 receptors. Proc Natl Acad Sci U S A 1999;96:14136-41. 31. Wagner JA, Járai Z, Bátkai S, Kunos G. Hemodynamic effects of cannabinoids: coronary and cerebral vasodilation mediated by cannabinoid CB(1) receptors. Eur J Pharmacol 2001;423:203-10. 32. Stein EA, Fuller SA, Edgemond WS, Campbell WB. Physiological and behavioural effects of the endogenous cannabinoid, arachidonylethanolamide (anandamide), in the rat. Br J Pharmacol 1996;119:107-14. 33. Lake KD, Martin BR, Kunos G, Varga K. Cardiovascular effects of anandamide in anesthetized and conscious normotensive and hypertensive rats. Hypertension 1997;29:1204-10. 34. Carruba MO, Bondiolotti G, Picotti GB, Catteruccia N, Da Prada M. Effects of diethyl ether, halothane, ketamine and urethane on sympathetic activity in the rat. Eur J Pharmacol 1987;134:15-24. 35. Abadji V, Lin S, Taha G, Griffin G, Stevenson LA, Pertwee RG, et al. (R)-Methanandamide: a chiral novel anandamide possessing higher potency and metabolic stability. J Med Chem 1994;37:1889-93. 36. Kunos G, Járai Z, Bátkai S, Goparaju SK, Ishac EJ, Liu J, et al. Endocannabinoids as cardiovascular modulators. Chem Phys Lipids 2000;108:159-68. 37. Lake KD, Compton DR, Varga K, Martin BR, Kunos G. Cannabinoid-induced hypotension and bradycardia in rats mediated by CB1-like cannabinoid receptors. J Pharmacol Exp Ther 1997;281:1030-7. 38. Járai Z, Wagner JA, Goparaju SK, Wang L, Razdan RK, Sugiura T, et al. Cardiovascular effects of 2-arachidonoyl glycerol in anesthetized mice. Hypertension 2000;35:679-84. 39. Huestis MA, Gorelick DA, Heishman SJ, Preston KL, Nelson RA, Moolchan ET, et al. Blockade of effects of smoked marijuana by the CB1-selective cannabinoid receptor antagonist SR141716. Arch Gen Psychiatry 2001;58:322-8. 40. Szabo B, Nordheim U, Niederhoffer N. Effects of cannabinoids on sympathetic and parasympathetic neuroeffector transmission in the rabbit heart. J Pharmacol Exp Ther 2001;297:819-26. 41. Varga K, Lake KD, Huangfu D, Guyenet PG, Kunos G. Mechanism of the hypotensive action of anandamide in anesthetized rats. Hypertension 1996;28:682-6. 42. Niederhoffer N, Szabo B. Cannabinoids cause central sympathoexcitation and bradycardia in rabbits. J Pharmacol Exp Ther 2000;294:707-13. 43. Ishac EJ, Jiang L, Lake KD, Varga K, Abood ME, Kunos G. Inhibition of exocytotic noradrenaline release by presynaptic cannabinoid CB1 receptors on peripheral sympathetic nerves. Br J Pharmacol 1996;118:2023-8. 44. Vidrio H, Sanchez-Salvatori MA, Medina M. Cardiovascular effects of (-)-11-OH-delta 8-tetrahydrocannabinol-dimethylheptyl in rats. J Cardiovasc Pharmacol 1996;28:332-6. 45. Ellis EF, Moore SF, Willoughby KA. Anandamide and delta 9-THC dilation of cerebral arterioles is blocked by indomethacin. Am J Physiol 1995;269:H1859-64. 46. Randall MD, Alexander SP, Bennett T, Boyd EA, Fry JR, Gardiner SM, et al. An endogenous cannabinoid as an endotheliumderived vasorelaxant. Biochem Biophys Res Commun 1996;229:114-20. 47. Zygmunt PM, Petersson J, Andersson DA, Chuang H, Sørgård M, Di Marzo V, et al. Vanilloid receptors on sensory nerves mediate the vasodilator action of anandamide. Nature 1999;400:452-7. 48. Pratt PF, Hillard CJ, Edgemond WS, Campbell WB. N-arachidonylethanolamide relaxation of bovine coronary artery is not mediated by CB1 cannabinoid receptor. Am J Physiol 1998;274:H375-81. 49. Holland M, John Challiss RA, Standen NB, Boyle JP. Cannabinoid CB1 receptors fail to cause relaxation, but couple via Gi/Go to the inhibition of adenylyl cyclase in carotid artery smooth muscle. Br J Pharmacol 1999;128:597-604. 50. Deutsch DG, Goligorsky MS, Schmid PC, Krebsbach RJ, Schmid HH, Das SK, et al. Production and physiological actions of anandamide in the vasculature of the rat kidney. J Clin Invest 1997;100:1538-46. 51. Bilfinger TV, Salzet M, Fimiani C, Deutsch DG, Tramu G, Stefano GB. Pharmacological evidence for anandamide amidase in human cardiac and vascular tissues. Int J Cardiol 1998;64 Suppl 1:S15-22. 52. Wagner JA, Varga K, Járai Z, Kunos G. Mesenteric vasodilation mediated by endothelial anandamide receptors. Hypertension 1999;33:429-34. 53. Ford WR, Honan SA, White R, Hiley CR. Evidence of a novel site mediating anandamide-induced negative inotropic and coronary vasodilator responses in rat isolated hearts. Br J Pharmacol 2002;135:1191-8. 54. Hajos N, Ledent C, Freund TF. Novel cannabinoid-sensitive receptor mediates inhibition of glutamatergic synaptic transmission in the hippocampus. Neuroscience 2001;106:1-4. 55. De Petrocellis L, Di Marzo V. Non-CB1, non-CB2 receptors for endocannabinoids, plant cannabinoids, and synthetic cannabimimetics: focus on G-protein-coupled receptors and transient receptor potential channels. J Neuroimmune Pharmacol 2010;5:103-21. 56. Felder CC, Nielsen A, Briley EM, Palkovits M, Priller J, Axelrod J, et al. Isolation and measurement of the endogenous cannabinoid receptor agonist, anandamide, in brain and peripheral tissues of human and rat. FEBS Lett 1996;393:231-5. 57. Bonz A, Laser M, Küllmer S, Kniesch S, Babin-Ebell J, Popp V, et al. Cannabinoids acting on CB1 receptors decrease contractile performance in human atrial muscle. J Cardiovasc Pharmacol 2003;41:657-64. 58. Gatley SJ, Lan R, Pyatt B, Gifford AN, Volkow ND, Makriyannis A. Binding of the non-classical cannabinoid CP 55,940, and the diarylpyrazole AM251 to rodent brain cannabinoid receptors. Life Sci 1997;61:PL191-7. 59. Randall MD, Kendall DA. Involvement of a cannabinoid in endotheliumderived hyperpolarizing factor-mediated coronary vasorelaxation. Eur J Pharmacol 1997;335:205-9. 60. Varga K, Wagner JA, Bridgen DT, Kunos G. Platelet and macrophage-derived endogenous cannabinoids are involved in endotoxin-induced hypotension. FASEB J 1998;12:1035-44. 61. Lagneux C, Lamontagne D. Involvement of cannabinoids in the cardioprotection induced by lipopolysaccharide. Br J Pharmacol 2001;132:793-6. 62. Joyeux M, Arnaud C, Godin-Ribuot D, Demenge P, Lamontagne D, Ribuot C. Endocannabinoids are implicated in the infarct size-reducing effect conferred by heat stress preconditioning in isolated rat hearts. Cardiovasc Res 2002;55:619-25. 63. Bouchard JF, Lepicier P, Lamontagne D. Contribution of endocannabinoids in the endothelial protection afforded by ischemic preconditioning in the isolated rat heart. Life Sci 2003;72:1859-70. 64. Lepicier P, Bouchard JF, Lagneux C, Lamontagne D. Endocannabinoids protect the rat isolated heart against ischaemia. Br J Pharmacol 2003;139:805-15. 65. Wagner JA, Abesser M, Harvey-White J, Ertl G. 2-Arachidonylglycerol acting on CB1 cannabinoid receptors mediates delayed cardioprotection induced by nitric oxide in rat isolated hearts. J Cardiovasc Pharmacol 2006;47:650-5. 66. Lamontagne D, Lepicier P, Lagneux C, Bouchard JF. The endogenous cardiac cannabinoid system: a new protective mechanism against myocardial ischemia. Arch Mal Coeur Vaiss 2006;99:242-6. 67. Mukhopadhyay P, Bátkai S, Rajesh M, Czifra N, Harvey-White J, Haskó G, et al. Pharmacological inhibition of cannabinoid receptor-1 protects against doxorubicin-induced cardiotoxicity. J Am Coll Cardiol 2007;50:528-36. 68. Blázquez C, Casanova ML, Planas A, Gómez Del Pulgar T, Villanueva C, Fernández-Aceñero MJ, et al. 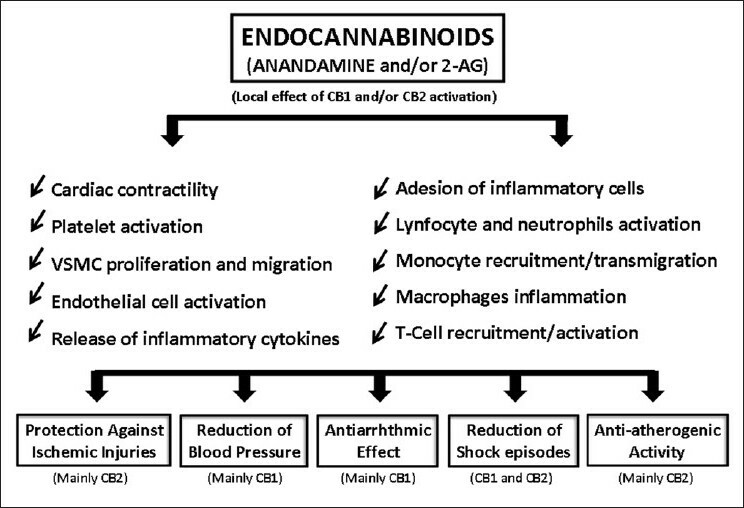 Inhibition of tumor angiogenesis by cannabinoids. FASEB J 2003;17:529-31. 69. Shmist YA, Goncharov I, Eichler M, Shneyvays V, Isaac A, Vogel Z, et al. Delta-9-tetrahydrocannabinol protects cardiac cells from hypoxia via CB2 receptor activation and nitric oxide production. Mol Cell Biochem 2006;283:75-83. 70. Krylatov AV, Ugdyzhekova DS, Bernatskaya NA, Maslov LN, Mekhoulam R, Pertwee RG, et al. Activation of type II cannabinoid receptors improves myocardial tolerance to arrhythmogenic effects of coronary occlusion and reperfusion. Bull Exp Biol Med 2001;131:523-5. 71. Di Filippo C, Rossi F, Rossi S, D'Amico M. Cannabinoid CB2 receptor activation reduces mouse myocardial ischemia-reperfusion injury: involvement of cytokine/chemokines and PMN. J Leukoc Biol 2004;75:453-9. 72. Wagner JA, Hu K, Karcher J, Bauersachs J, Schäfer A, Laser M, et al. CB(1) cannabinoid receptor antagonism promotes remodelling and cannabinoid treatment prevents endothelial dysfunction and hypotension in rats with myocardial infarction. Br J Pharmacol 2003;138:1251-8. 73. Pacher P, Batkai S, Kunos G. The endocannabinoid system as an emerging target of pharmacotherapy. Pharmacol Rev 2006;58:389-462. 74. Klein TW. Cannabinoid-based drugs as anti-inflammatory therapeutics. Nat Rev Immunol 2005;5:400-11. 75. Freund TF, Katona I, Piomelli D. Role of endogenous cannabinoids in synaptic signalling. Physiol Rev 2003;83:1017-66. 76. Hampson AJ, Grimaldi M, Lolic M, Wink D, Rosenthal R, Axelrod J. Neuroprotective antioxidants from marijuana. Ann NY Acad Sci 2000;899:274-82. 77. Nagayama T, Sinor AD, Simon RP, Chen J, Graham SH, Jin K, et al. Cannabinoids and neuroprotection in global and focal cerebral ischemia and in neuronal cultures. J Neurosci 1999;19:2987-95. 78. Mauler F, Mittendorf J, Horvath E, De Vry J. Characterization of the diarylether sulfonylester (-)-(R)-3-(2-hydroxymethylindanyl-4-oxy)phenyl-4,4,4-trifluoro-1-sulfonate (BAY 38-7271) as a potent cannabinoid receptor agonist with neuroprotective properties. J Pharml Exp Ther 2002;302:359-68. 79. Leker RR, Gai N, Mechoulam R, Ovadia H. Drug-induced hypothermia reduces ischemic damage: effects of the cannabinoid HU-210. Stroke 2003;34:2000-6. 80. Hayakawa K, Mishima K, Abe K, Hasebe N, Takamatsu F, Yasuda H, et al. Cannabidiol prevents infarction via the non-CB1 cannabinoid receptor mechanism. Neuroreport 2004;15:2381-5. 81. Louw DF, Yang FW, Sutherland GR. The effect of delta-9-tetrahydrocannabinol on forebrain ischemia in rat. Brain Res 2000;857:183-7. 82. Parmentier-Batteur S, Jin K, Mao XO, Xie L, Greenberg DA. Increased severity of stroke in CB1 cannabinoid receptor knock-out mice. J Neurosci 2002;22:9771-5. 83. Muthian S, Rademacher DJ, Roelke CT, Gross GJ, Hillard CJ. Anandamide content is increased and CB1 cannabinoid receptor blockade is protective during transient, focal cerebral ischemia. Neuroscience 2004;129:743-50. 84. Zhang M, Martin BR, Adler MW, Razdan RK, Jallo JI, Tuma RF. Cannabinoid CB(2) receptor activation decreases cerebral infarction in a mouse focal ischemia/reperfusion model. J Cereb Blood Flow Metab 2007;27:1387-96. 85. Ashton JC, Rahman RM, Nair SM, Sutherland BA, Glass M, Appleton I. Cerebral hypoxia-ischemia and middle cerebral artery occlusion induce expression of the cannabinoid CB2 receptor in the brain. Neurosci Lett 2007;412:114-7. 86. Ashton JC, Smith PF. Cannabinoids and cardiovascular disease: the outlook for clinical treatments. Curr Vasc Pharmacol 2007;5:175-85. 87. Ribuot C, Lamontagne D, Godin-Ribuot D. Cardiac and vascular effects of cannabinoids: toward a therapeutic use? Ann Cardiol Angeiol (Paris) 2005;54:89-96. 88. Moezi L, Gaskari SA, Lee SS. Endocannabinoids and liver disease. V. endocannabinoids as mediators of vascular and cardiac abnormalities in cirrhosis. Am J Physiol Gastrointest Liver Physiol 2008;295:G649-53. 89. Sarzani R. Endocannabinoids, blood pressure and the human heart. J Neuroendocrinol. 2008;20 Suppl 1:58-62. 90. Wagner JA, Varga K, Ellis EF, Rzigalinski BA, Martin BR, Kunos G. Activation of peripheral CB1 cannabinoid receptors in haemorrhagic shock. Nature 1997;390:518-21. 91. Wagner JA, Hu K, Bauersachs J, Karcher J, Wiesler M, Goparaju SK, et al. Endogenous cannabinoids mediate hypotension after experimental myocardial infarction. J Am Coll Cardiol 2001;38:2048-54. 92. Pacher P, Beckman JS, Liaudet L. Nitric oxide and peroxynitrite in health and disease. Physiol Rev 2007;87:315-424. 93. Archer RA. The cannabinoids: therapeutic potentials. Annu Rev Med Chem. 1974;9:253-9. 94. Birmingham MK. Reduction by 9-tetrahydrocannabinol in the blood pressure of hypertensive rats bearing regenerated adrenal glands. Br J Pharmacol 1973;48:169-71. 95. Pacher P, Bátkai S, Kunos G. Blood pressure regulation by endocannabinoids and their receptors. Neuropharmacology 2005;48:1130-8. 96. Crawford WJ, Merritt JC. Effects of tetrahydrocannabinol on arterial and intraocular hypertension. Int J Clin Pharmacol Biopharm 1979;17:191-6. 97. Bátkai S, Pacher P, Osei-Hyiaman D, Radaeva S, Liu J, Harvey-White J, et al. Endocannabinoids acting at CB1 receptors regulates cardiovascular function in hypertension. Circulation 2004;110:1996-2002. 98. Steinberg B, Cannon C. Cannabinoid-1 Receptor Blockade in Cardiometaolic Risk Reduction; Safety, Tolerability, and Therapeutic Potential. Am J Cardiol 2007;100:27P-32. 99. Bátkai S, Rajesh M, Mukhopadhyay P, Haskó G, Liaudet L, Cravatt BF, et al. Decreased age-related cardiac dysfunction, myocardial nitrative stress, inflammatory gene expression, and apoptosis in mice lacking fatty acid amide hydrolase. Am J Physiol Heart Circ Physiol 2007;293:H909-18. 100. Mach F, Steffens S. The Role of the Endocannabinoid System in Atherosclerosis. J Neuroendocrinol 2008;20 Suppl 1:53-7. 101. Leite CE, Mocelin CA, Petersen GO, Leal MB, Thiesen FV. Rimonabant: an antagonist drug of the endocannabinoid system for the treatment of obesity. Pharmacol Rep 2009;61:217-24. 102. Van Gaal LF, Rissanen AM, Scheen AJ, Ziegler O, Rossner S. Effects of the cannabinoid-1 receptor blocker rimonabant on weight reduction and cardiovascular risk factors in overweight patients: 1-year experience from the RIO-Europe study. Lancet 2005;365:1389-97. 103. Klein TW, Newton C, Larsen K, Lu L, Perkins I, Nong L, et al. The cannabinoid system and immune modulation. J Leukoc Biol 2003;74:486-96. 104. Braunersreuther V, Mach F. Leukocyte recruitment in atherosclerosis: potential targets for therapeutic approaches? Cell Mol Life Sci 2006;63:2079-88. 105. Miller AM, Stella N. CB2 receptor-mediated migration of immune cells: it can go either way. Br J Pharmacol 2008;153:299-308. 106. Despres JP, Golay A, Sjostrom L. Effects of rimonabant on metabolic risk factors in overweight patients with dyslipidemia. N Engl J Med 2005;353:2121-34. Battista, N. and Di Tommaso, M. and Bari, M. and Maccarrone, M.